One day, the puffy cloud began to get gray and much heavier. The raindrops knew this meant a storm was about to happen. When the lightning began to flash and when the thunder began to boom, all the raindrops got together for a big meeting. 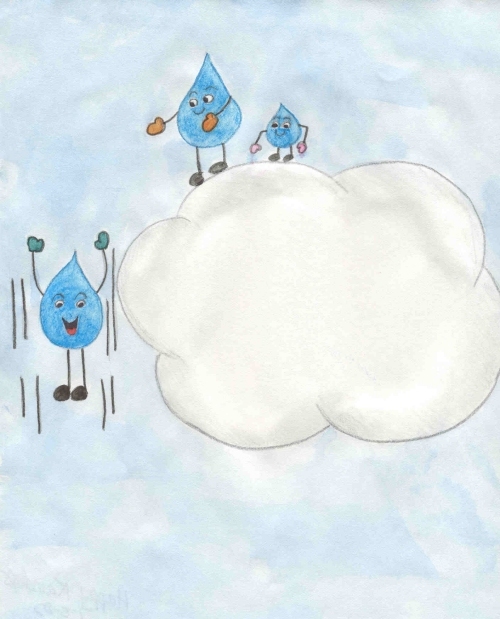 In this meeting they planned where each drop of rain was going to land. The biggest raindrop of all was called Randall. He got to choose first. Then, each in turn, according to size, chose a target, until the smallest raindrop had chosen. "I think I will land on that man’s nose," Randall said, parting the cloud just a little bit to show everyone. He pointed to a man sitting on a bench in the park. The other raindrops giggled. "Here I go," Randall cried, then away he went, falling from the big gray could, through the stormy sky. He landed right in the middle of a man’s nose. He broke into pieces and went all over the man’s face, into his eyes and onto his lips. "My turn," called Reese, the next largest raindrop. He had decided to land in a lady’s eye and smear her make-up. He jumped down through the small part in the cloud and landed with a kerplop right in her eye. Her make-up ran down her cheek and dropped onto her white blouse, making a mess. The first group chose to rain on an ant’s nest. They all held hands and jumped down together. When they hit the nest, the dirt went flying everywhere. The carefully dug tunnels collapsed and the angry ants ran about trying to save their nest. The next group of raindrops landed on a boy’s fluffy cotton candy. It dissolved into a sticky mess, leaving the small child crying. "Let’s land on that woman," suggested the leader of the third group. "She just came out of the beauty parlor." The rest of them tee-heed and giggled, then they all held hands and jumped. Plop! Plop! Plop! They all landed on her nicely combed hair. The curls turned into soggy, limp ropes. The raindrops all seemed to be enjoying themselves, except one small group. They were the smallest of all the raindrops. They didn’t like to do all those mean things. Rebecca was the biggest raindrop of the group. She said to the others, "Let’s have our group do something nice. Look down there for something that wants and needs us to rain on it." They watched carefully. They saw a boy with a triple-decker ice cream cone. He didn’t need any rain. A family was in the park having a picnic. They didn’t want it to rain. There was also a beautiful wedding taking place and the raindrops knew that they didn’t want it to rain and ruin everything. Rylee, the teeniest raindrop, spotted a little flower. It was a pretty yellow color, but was starting to turn brown around the edges. Its head was drooping. Rylee cried out to the others, "Rebecca, come and look. That little flower needs us." The rest of them also looked down. That would be a nice thing to do. Rebecca said, "Let’s go!" Just as they were about to jump, another group started to call them names. The biggest, Ryan, said, "All the rest of us are trying to make people cry and be angry. You aren’t like us. Hurry up and leave! Don’t come back to this cloud every again! We don’t like nice raindrops!" The storm broke and the rain stopped. The sun came out and dried up the rain. It turned to steam and floated back up into the sky to form new clouds. The small group that Rebecca and Rylee were in chose to form a new cloud where no mean raindrops were allowed. Every time they fell from the sky, they chose something that would be happy because they rained on it.